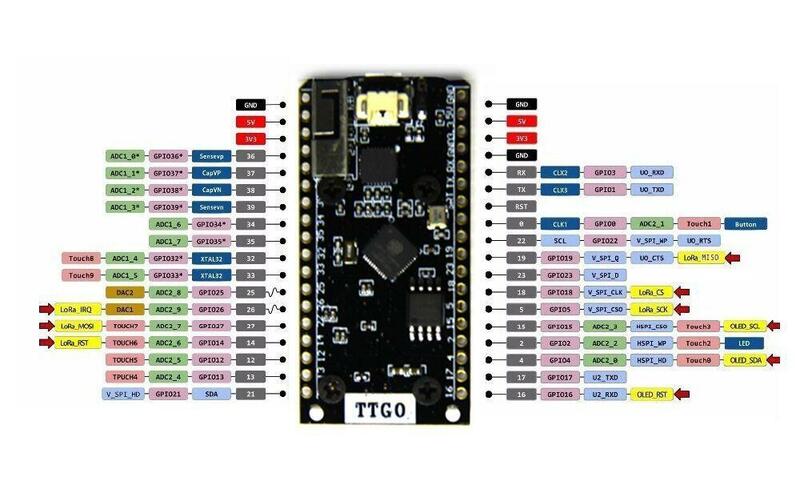 The TTGO LoRa32 is an ESP32 based board that features Wifi and BlueTooth low energy but also includes an external Lora chip, in my case the SX1276 868Mhz version. The following code/hack is just to test the feasibility of bridging BLE devices over the ESP32 and then to Lorawan, more specifically sending BLE data to the LoraWan TTN network. I’m using Neil Koban ESP32 BLE library, that under platformIO is library number 1841 and the base ABP code for connecting to TTN. In simple terms this code just makes the ESP32 to emulate a BLE UART device for sending and receiving data. It does that by using the Nordic UART known UUID for specifying the BLE UART service and using also the Nordic mobile applications, that supports such device, for sending/receiving data. Using the Nordic mobile Android phone applications, data can be sent to the Lora32 board either by using the excellent Nordic Connect application or by also using the simpler and direct Nordic UART application. The tests program just receives data through BLE and buffers it onto an internal message buffer that, periodically, is sent through Lora to the TTN network. I’ve decided arbitrary that the buffer is 32 bytes maximum. We should keep our message size to the necessary minimum, and also just send few messages to keep the lorawan duty factor usage within the required limits. So, using the following code we can use our phone to scan from the ESP32 BLE device named TTGOLORAESP32 connect to it and send data to the device. 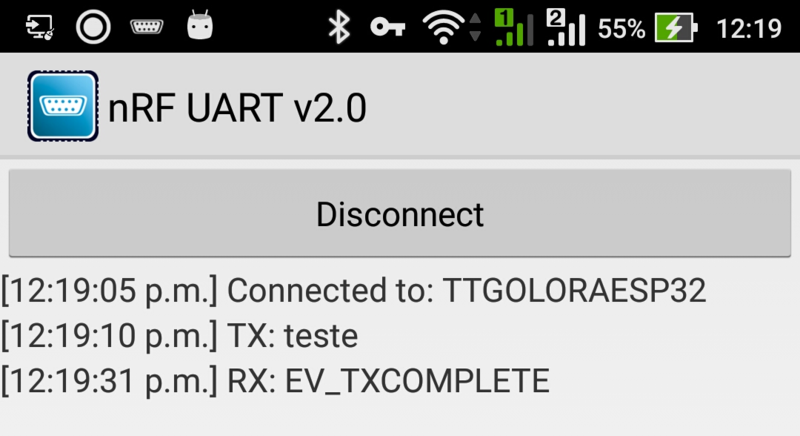 After a while, when the transmission event fires up, data is transmitted, and the BLE device just receives a simple notification with the EV_TXCOMPLETE message. The board also has a LiPo connector, and probably a charger circuit, since I haven’t tried it yet, a user controlled blue led, and a very dim red power led. The led is so dim that at first I thought the board was broken/short circuited, but it is normal. The Lora Antenna is connected by U.FL/IPEX connector. Both a U.FL to SMA adapter cable is provided and also a cable to connect to the LiPo connector. EDIT: Thanks to Andreas on the comment section to point out that this image, while is correct for my board version (with the “3D” metal antenna under the board), the pin labels ARE WRONG. So much for copy it from the seller page. The (so far yet…) pins mapping are on the bellow image. I’ve checked with my physical board and it seems right now. I hope this corrects definitely the issue. The Blue Led Pin is at Pin 2, and according to the sample code the Oled Display is at I2C address 0x3C. 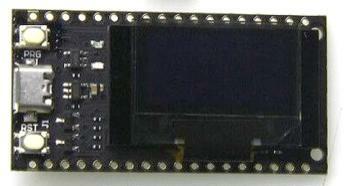 The I2C bus where the OLed is at SDA pin 4 and SCLK pin 15. Also it seems there are at least two revisions for the ESP32 silicon, Revision 0 (Zero) for the initial one, and the latest, at the current date, Revision one. The board can be programmed easily with Platformio IDE by selecting as the target board the Heltec Wifi Lora board. Probably both boards are identical. With this, the sample TTN INO sketchs for connecting either through ABP or OTAA work flawlessly without any issue by using the above LMIC pins configuration. Since we have the OLed, we can use the RX window to display the received RSSI of our messages on the gateway. This only works if the downlink messages from the gateway can reach back our node, so it might not work always. In my case, I’m about 3Km from the gateway in dense urban area, and not always I can display the packet RSSI. We build then the response object and send it back to the TTN servers that send it to our node. The received data is then displayed on the Oled. Just make sure that we have the TTN nodes installed, and change the credentials for your TTN Application. I haven’t yet tried the WiFi and checked if the metal antenna is any good, but with my preliminary tests, it seems it’s not very good. It cropped up on my news feed here on WordPress an article regarding three major flaws on the Lorawan protocol. Since I’m following the Lorawan topic I was interested to see what those “Major” flaws where, and found it rather interesting, that the text, also derived from a commercial vendor, looked like the conundrum story like if a glass is half full or half empty. First there is an huge misconception regarding low power communications protocols (LPWAN), being either Lorawan, Sigfox or anything else. The key is power, and lower power usage, the less the better. Asking for LPWAN protocols to do the same that other high energy, higher bandwidth protocols can do, is mixing apples with oranges. – All uplink messages are unacknowledged. Also any protocols that use the ISM radio bands must obey the defined rules by the government bodies that control the radio spectrum. These rules apply to any protocol on those bands, so it’s not a flaw specific to any protocol. The 1% duty cycle applies to Lorawan and SigFox. In fact Sigfox will enforce the 1% duty cycle by refusing messages that exceed that percentage, and the LoraWan backend provider The Things Network will do the same. Also there is some confusion regarding the medium access protocol, in this case the radio spectrum. The medium is shared by anyone, so collisions and interference will happen. Sigfox adds some resilience to this this by transmitting each message three times in three different ISM band frequencies, for example. As Lorawan it also doesn’t check for the medium before transmitting but only transmits once, since the physical modulation CSS (Chirp Spread Spectrum) has more resilience to interference. Also due to the availability of what is called Spread Factor, several transmissions can happen at the same time at the same frequency, and successfully be decoded at the other end. On radio protocols checking for medium occupancy before transmitting only makes sense for non constrained devices, since the process of checking the medium before transmitting will consume power (a lot by having the radio on) and without any sort of guarantee that interference will not start right away or the interferance is happening not at the node side, but on the gateway side. So since one of the engineering requirements for LPWAN is low power, then the exchange between power and medium access control is made, which means ALOHA and let’s transmit!. So now we can have devices that have batteries that last years. I find this one rather funny since, turning on my radio can catch any available radio broadcasters, or any radio scanner can receive anything. Just check out Web SDR for hours of amusement. The fact that all gateways see all traffic is a direct consequence of the radio medium, not an issue with the protocol. Any protocol that uses radio has the same “flaw” and it applies to Lorawan, SigFox, UNB, Weightless, 3G, LTE, you name it. To solve this, encryption is used and at least in Lorawan there are several encryption keys and ways of providing them. Lorawan can use fixed provided keys (ABP – Activation by personalisation) or variable keys through OTAA (over the air activation). Anyway the gateways can receive any Lorawan packets, but without at least the 128 bit Network key and 128 bit application key, can’t do anything with the data. Gateways only forward data to network backend servers, and there, if they have the correct keys, decryption can be done and data forward to the correct application servers. Check out this for more information. Well, yes, it is a SPREAD spectrum technology and it makes part of the holy war between Narrow band supporters vs Wide band supporters. Ones say that UNB is better, others don’t, and so on. Spread spectrum technology exists since a long time ago. Lorawan bandwidth can be 150Khz, 250Khz and 500Khz vs the 200Hz of Sigfox. While SST can be used and detected below the noise floor level and accepts variations on the frequencies (reflections, Doppler effects), UNB is, on the receiver side way more complicated since it requires very precise crystals for frequency reference and higher power levels on the spectrum. So in the article that I read it seems that Lorawan SST is just bad, without any consideration of the advantages vs UNB, which by itself is a discussion on different technologies which have advantages and disadvantages each. Nothing is perfect in engineering. Trade offs need to be made to achieve the requested requirements, and then based on the initial implementations, improve on it. So Lorawan, as Sigfox, solve the same issues by different means with the associated advantages and disadvantages. So the above flaws, are just engineering trade offs that can be applied to any protocol. Low Power Wide Area Communications (LPWAN) classifies a group of communication protocols featuring low power usage and a high communication range. For Internet of Things communications, where battery powered devices and constrained devices (weak CPU, low RAM/ROM) are the norm, LPWAN use as the communication protocol for IoT makes sense, since it makes possible to have standalone devices with batteries that last years, instead of hours or days, and might be hundreds of meters to Kms away from a base station/gateway. But LPWAN protocols, in contrast have low communication bandwidth, since from power, range and bandwidth, we can only have two of those, and while this might be a problem for certain applications, IoT devices don’t require high bandwidth and since most have sparse communication requirements, and when they do communicate they don’t need to transmit a lot of data. One of the possible ways of starting to use LPWAN networks in our IoT devices, is to use a LPWAN protocol named LoraWan, which is based on the Lora physical protocol, and if available at our area, the crowd sourced LPWAN network The Things Network as the backend network for receiving data. Lora uses the 868Mhz ISM radio band and it uses a form of signal transmission called CSS. The ISM radio band can be used freely by everybody, but under certain rules that depends of the country where the devices are located. So to use that band, rules like maximum emission power and duty cycle (usage of the available spectrum) are defined, and in Europe, the maximum power is 20mW and 1% duty cycle per day. Additionally the back end operator can add other restrictions. Over Lora, the Lorawan protocol is an open standard and source code for implementing it is available and already ported to several devices, including the Arduino, Raspberry PI and the ESP8266, among others. Based on this library we can build code and nodes that are able to transmit data through LoraWan to a network backend. Specifically for the Arduino, the Atmega328 is the bare minimum to begin with, since the library, due to use of AES encryption functions occupies a lot of memory. The backend can be provided by really anyone, including Telco operators, or private and crowd source operators like The Things Network (TTN). TTN provides the backend and management services, but depends on crowd sourced gateways, and might not be available at our area. Still it is possible, for testing, to build our own gateways, our buy them, and connect them to the Things Network. TTN doesn’t require any access fees (yet). So with LoraWan an the Things Network, we can build our own nodes and gateways since code and hardware can be easily obtained, connect them and use it to build applications. Regarding LoraWan we can also read this great introduction from Design Spark. Anyway the easiest way for starting up using Lora and Lorawan, is to buy an Dragino Lora Shield and connect it to an Arduino Uno or Mega. This is a great shield to startup since doesn’t need any soldering or complex configuration, just plug it on an Arduino shield and use the LMIC library and some code samples. Also the Dragino Shield can be used to build a simple gateway by connecting it to a Raspberry PI or ESP8266 to build what is called a single channel gateway, that allows to test gateway functionality, but it isn’t quite compatible with the LoraWan specifications. Anyway it gets the job done if there is no gateway nearby. Just make sure that you by version 1.3 or 1.4 of the shield. Mine also came with an SMA antenna. Other alternatives to start using Lorawan are available at eBay/Aliexpress and other renowned name shops, namely Lora radio transceivers at around 8/16€, for example the HopeRF RFM95. Those we can also use them with Arduino or ESP8266 to build our nodes or single channel gateways. Just make sure that the frequency for these modules and shields must match the allowed radio transmission frequency in your area. In my case, in Europe is 868Mhz, but for example at USA is 900Mhz. The other set defines which data pins of the RFM95 module are exposed to the shield allowing them to be connected to the Arduino: JP# Jumpers. The RFM95 pin DI0 is permanently connected to Arduino pin D2. The RFM95 pin RST (Reset) is permanently connected to Arduino pin D9. RFM95 DI1 – Receive timeout for Lora mode. RFM95 DI2 – Receive timeout for FSK mode. RFM95 DI5 – Used by Semtech Library. LMIC library doesn’t use it. SV2 – SPI Clock line. Default on pin D13, otherwise on Arduino SPI CLK on the ICSP header. SV3 – SPI Data line In (MOSI). Default on pin D11, otherwise on Arduino MOSI pin on the ICSP header. SV4 – SPI Data line Out (MISO). Default on pin D12, otherwise on Arduino MISO pin on the ICSP header. The SPI Chip Select line is always at pin D10. So now we know that D10, D9 and D2 are used permanently connected and used by the shield, and the others can be connected or disconnected if needed or not. To start using the Dragino Lora Shield so it connects to a LPWAN network, we can start using the following example: TTN node by ABP. ABP means Activation by Personalization, which means that all data for joining the network will be explicitly defined on the code. Other alternative would be OTAA: Over the air activation, where the gateway sends the configuration data to the node. Since we don’t know if we have a gateway in range, let’s start first with ABP mode. The above code uses the LMIC library for implementing the LoraWan stack. Since LMIC library doesn’t use DI05, we can remove the JP3 jumper, and free this IO line for other things, like another shield. .nss = 10,                   //Chip Select pin. In our case it is always D10. .rxtx = LMIC_UNUSED_PIN,     //Antenna selection pin: not used in our case. Connecting to The Things Network (TTN) depends of course of an available TTN gateway at the nodes range. Still we need to configure some parameters to allow the node to connect. On this example the connection is done through Activation by Personalization. This means that we should put on our code the Network Session key and Application Session key on the code. To obtain these values we need to register on the TTN site, TTN Dashboard and add an ABP device.. In my area there are at least, supposedly, two active TTN gateways and I’m around 2Km’s away from them in a dense urban area. But when running the sketch the first times, I had no results what so ever. With SF12 the message started be received and the sequence numbers of the messages received where continuous, so no lost messages. Dropping to SF11, also worked fine, and the message sequence received and shown on the TTN Dashboard where still continuous. At SF10, some of the messages where lost, almost 75% of them. In this case, arranging the antenna position (to exactly vertical) and placement did alter the reception successes. After the data is at the TTN backend there are several ways of getting it. For reference on the TTN site there are instructions in how to access the data.